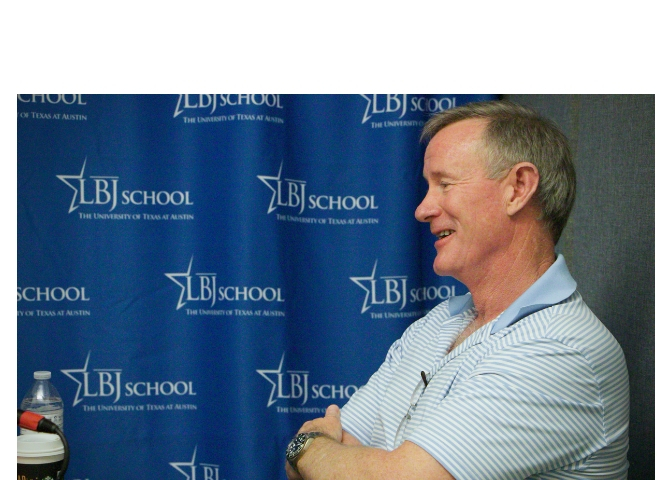 New LBJ School professor Adm. William McRaven speaks candidly on lessons learned throughout his distinguished career, focusing on purpose, failure and trust. Adm. McRaven, former University of Texas System chancellor and retired U.S. Navy four-star admiral, joins the LBJ School as a professor in national security. As chancellor, he oversaw 14 institutions that educate 221,000 students and employ 20,000 faculty and more than 80,000 health care professionals, researchers and staff. As the commander of U.S. Special Operations Command, McRaven led a force of 69,000 men and women and was responsible for conducting counter-terrorism operations worldwide. He is a recognized national authority on U.S. foreign policy and has advised presidents George W. Bush and Barack Obama and other U.S. leaders on defense issues. McRaven oversaw the 2011 Navy SEAL raid in Pakistan that killed al-Qaeda leader Osama bin Laden. His book, "Spec Ops: Case Studies in Special Operations Warfare: Theory and Practice," published in several languages, is considered a fundamental text on special operations strategy. He has received the Republic of France's Legion d'Honneur, the Federal Law Enforcement Officers Association's National Award and the National Intelligence Award. In 2016, McRaven was named the recipient of the Ambassador Richard M. Helms Award by the Central Intelligence Agency Officers Memorial Foundation. The LBJ School's podcast, "Policy on Purpose," takes listeners behind the scenes of policy with the people who help shape it. Host Angela Evans, dean of the LBJ School, dives into real-world and timely policy topics with leading experts from the school and the policy world at large.